Multi purpose, food grade PTFE spray for light lubrication. 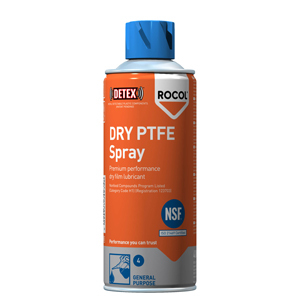 Non-toxic PTFE spray for use as a dry anti-stick film or light lubrication of links, pins, chutes, slides etc. operating in food/clean environments. Temperature range -200° C to +270°. Light film - does not easily transfer. Insoluble in water and solvents. Clean, dry, non-toxic, colourless film. Does not contain: mineral hydrocarbons, animal derived materials, nut oils or genetically modified ingredients. FDA Group 21 CFR 178.3570.